Water Heater FAQ: Tank or No Tank? As spring progresses slowly but surely toward the summer season, the majority of homeowners are shifting their focus toward their air conditioning systems. Don’t get so preoccupied with thoughts of the warmer weather to come that you overlook your other systems and appliances, though. This is especially true of your water heater, which, unlike your heater or AC, does not have an off-season. If you are ready to replace an old water heater, or if you need to purchase one for a new home construction process, you need to choose that system carefully. The two major contenders for most homeowners today are tank and tankless water heaters (though we also install and service solar water heaters). 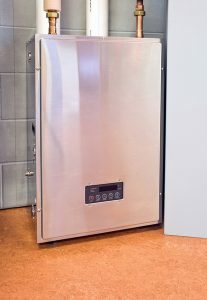 Because investing in a new water heater is a pretty major expense, and because you will rely on this system for so many daily tasks, it really is vital that you get the water heater best suited to your needs. When you schedule your water heater services in Madera, CA with us, you’ll have no doubt about it. Posted in Water Heaters | Comments Off on Water Heater FAQ: Tank or No Tank? Now that the chilliest days and nights of the year are behind us once more, many homeowners are turning their minds to their air conditioners. When the temperatures really heat up in this area, there is just no way to live in comfort without a great air conditioner working at peak performance levels in your home. That is why any problems with your air conditioner are of such serious concern. Perhaps with the exception of a total breakdown, the most obvious cause of air conditioning trouble is a system that is blowing warm air. If you have warm air coming from your AC vents, you need to contact a member of our team right away. The longer that you wait to do so, the worse off your comfort and very likely your system will be. Don’t let manageable problems turn into very serious headaches due to inaction on your part. We’re here to guarantee that your air conditioning repairs in Fresno, CA are completed properly.